About the quality. Quality, not quantity. Don’t ask someone to become your subscriber, reader, follower. Do not waste time and effort. It’s no use. These fans do not bring any benefit. Much more important to improve yourself. To develop myself constantly. Without stops and interruptions. Only then all around you will meet interesting, loyal, quality audience. And the more interesting you become, the more interesting people will gather around you. That should be the goal, not some astronomical, but completely useless, the numbers on the counter. About vampires. Interesting way to identify energy vampires. You just need to talk with someone. If after talking, you’re tired, exhausted, emptied – before your typical vampire. If after chatting you are full of energy and ideas in front of you is a good conversationalist. Last you need to leave and to always keep close. And vampires – completely displace from your life. About Internet friends. Meet people offline. Even if your online friends, try to find ways to meet them in reality. In a cafe, in a Park, at your home. This will allow you to gather real friends and colleagues. Even if the resource on which you regularly communicate, closes the contacts will remain. Friends are not going anywhere. About the criticism. Learn to take a punch. Each of your work that you show to your colleagues, friends, subscribers, cause a wave of reactions. It may be praise, but it could be a criticism. And not always constructive. In such situations, it is important to be able to take a punch. Most importantly, never, under any circumstances, feed the trolls. Trolls are people who criticize you just to annoy. They’re not helpful, they are not constructive, they are useless to you. Remove from friends, block, don’t let comment on your blogs and social network profiles. Keep your “home”. About the corruption. Don’t be afraid to sell. Any person, whether an artist or a sales Manager, you need to eat, to dress, he needs housing. Without money in our time is not to live. So don’t be afraid to sell what you create. If after this you will go from part of the audience, accusing you of corruption, do not worry. Real friends, colleagues, subscribers behave will not. Will be filtered out only those who should leave. The rest will remain with you. About time. At some point of your career, you will have little time. Will have to choose – or more to work and less to communicate with the audience, or Vice versa. Of course better work. Not working, you’re not progressing. And, over time, you will become uninteresting to the audience. To communicate with followers, colleagues, fans, online friends, idols need to provide the clock in his spare time. And nothing else. About ongoing process. Never stop, never give up. Success will come, if you long to go to him. Finished one project, begin immediately the second. And so on. Going to bed, create a start for tomorrow’s work. If you are a writer, write the first sentence of the next Chapter. If you are an artist – do a couple of coats. Once reached the planned level of skill, you immediately set yourself a new benchmark. If you’ll just sit pretty and count myself a Pro, not developing further, will soon forget about you, you cease to appreciate, you will notice some degradation. This applies to any field. 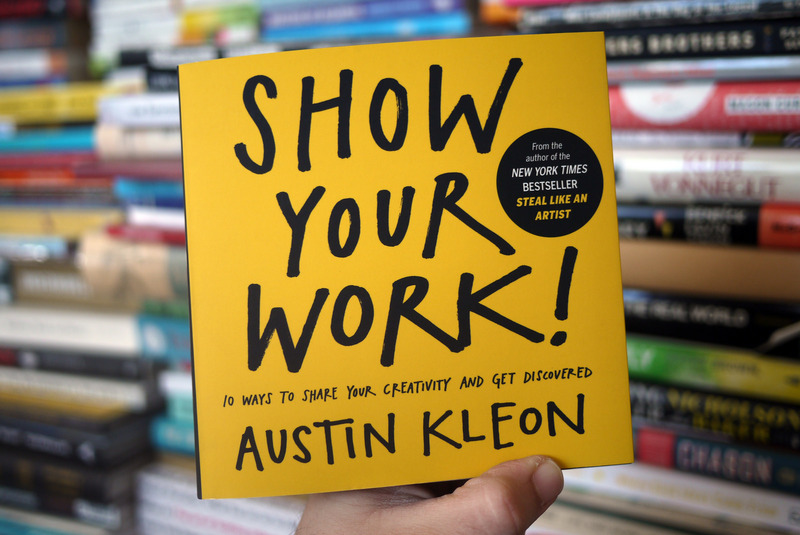 These are just a few bright thoughts from the book of Austin Cleon “Show your work”. Having studied it yourself, you will find a lot of interesting ideas, tips, recommendations that will make your life and work more colorful and varied. Happy reading!